Clear View II Front Wiper Parking Area defrosters melt snow and ice low along the bottom of the front windshield to limit build up and stop wiper freezing even in the toughest weather. Available in 12 and 24 volt. Available in several models, Clear View Front Wiper Defrosters fit vehicles from passenger cars all the way up to the largest plow truck. Download the wiper parking product information at the link above. 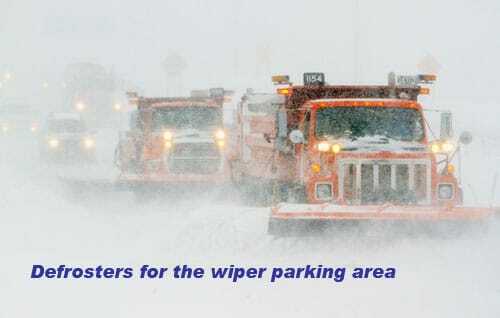 Save wiper arms and wiper transmissions plus eliminate stopping to clear the wiper rest area. Enhanced wiper area heating complements the existing hot air defroster effectively eliminating wiper freezing and reducing snow build-up even in the most challenging winter conditions. The defroster elements are sandwiched between two pieces of release paper that when separated allow perfect alignment on the glass. Defrosting is accomplished through contact between the Clear View defroster elements and the window. The defroster is connected electrically through the buss bar tabs and activated with the automatic ThermaSync defroster control and switch. We have reduced the spacing between the heating elements to provide better heat density low on the windshield in the wiper parking area. This better heating performance keeps the wipers moving even in the coldest conditions. 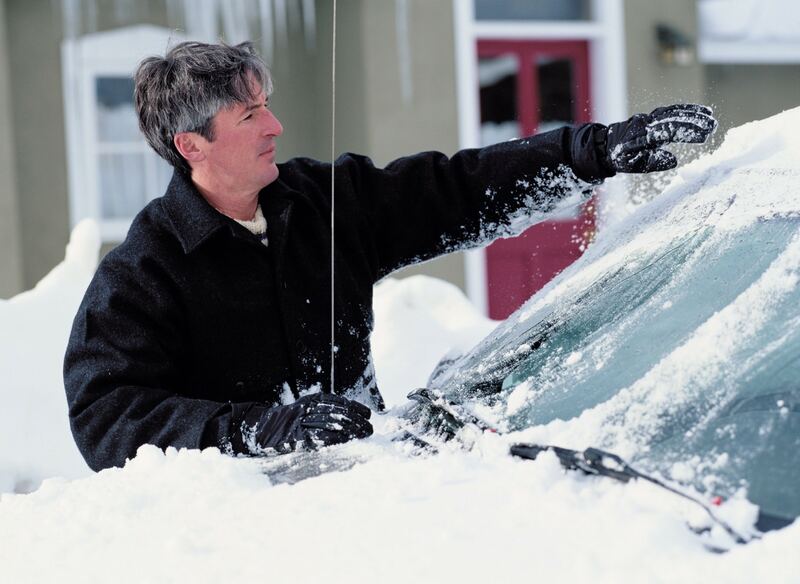 All units have a defroster only replacement option or Stick Kit to accommodate glass damage and windshield replacement. Front wiper heaters include the ThermaSync 2812 defroster control. This control provides power modulation and automatic timer shut off. The timer options include 10, 20, 40, 80, 160 minutes and manual off. The timer can be set in the field and eliminates the need for repeated defroster button pushes on long shifts. Installing the Clear View Front Wiper Parking Area defrosters is limited to larger vehicles with flatter windshields and adequate room for installation. Many light trucks have steeply sloping windshields and minimum clearance between the glass and dash surfaces which can make installation challenging. Front wiper parking area defroster for single piece windshields. This defroster has six gridlines measuring 5 inches (12.3) in height. 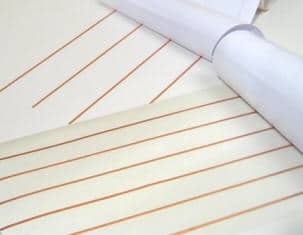 Minimum length is 48 inches, maximum 71 which is trimmed to size during installation. Connection tabs are both on the same side for easy wiring. Twenty minute automatic shut off is standard but can be changed. 12 Volts, 50% Modulation. Installation ready. Does NOT include Switch Boss. What’s Included : Single Piece Front Windshield Defroster. Includes ThermaSync 2812 control, switch, wire harness and installation pack. Twenty minute timer, 12 Volts, 50% modulation. The wiper push area defroster is installed vertically along the edge of the windshield in the wiper push area. Compatible with single and two piece windshields. This defroster has four gridlines measuring 3.5 inches (8.9) in width. Minimum length is 20 inches, maximum 27. Connection tabs are both on the same side for easy wiring. Twenty minute automatic shut off. 12 Volts, 12% modulation. Installation ready. Does NOT include Switch Boss. What’s Included : Vertical Side Wiper Push Area Defroster. Includes ThermaSync 2812 control, switch, wire harness and installation pack. 12 Volts, 12% modulation. Switch Boss allows single switch operation of two or more Clear View defrosters. Fully configured at the factory and ready to install the Switch Boss can be used to operate both the front wiper parking area defroster (FWH) and the vertical side wiper push area defroster (SWH) from a single switch. Works with 12 and 24 volt systems. Front wiper parking area defroster for two piece windshields. This defroster has six gridlines measuring 5 inches (12.3) in height. Minimum length is 24 inches, maximum 40. Tabs are both on the same side for easy wiring. Both defrosters are controlled from a single switch. Twenty minute automatic shut off. Switch Boss is NOT needed for this defroster. Installation ready. 12 Volts, 50% modulation. What’s Included : Front Wiper Parking Area Defroster, two piece windshield. Delivered complete ready to install including defroster, 2812 ThermaSync control, switch, wire harness and installation pack. 12 Volts, 50% modulation. The complete defrosters are delivered ready to install including defroster, 2812 ThermaSync control, switch, wire harness and installation pack. 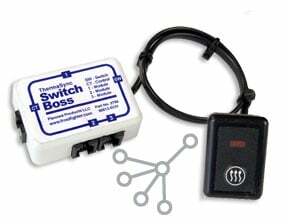 If single switch operation of multiple defrosters is desired then the addition of a Switch Boss is recommended. The Switch Boss allows two or more defrosters to be operated from a single switch ideal installing multiple defrosters in a cab. For example the vertical wiper push defroster with the front wiper parking area defroster can be networked together for single switch operation. Up to four defrosters can be networked using Switch Boss. Requires 2812/2824 TheramSync controls.